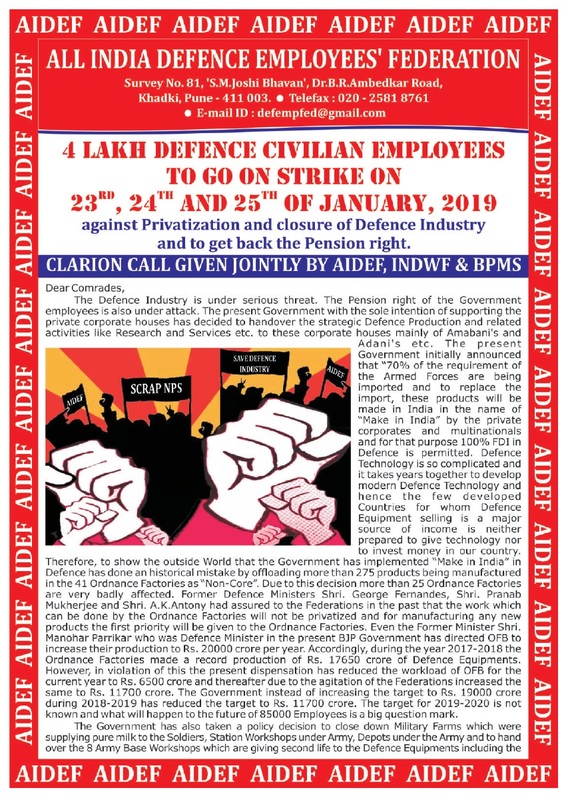 Defence Employees Strike on 23-25 January 2019. All the three Federations of the Defence employees have called upon the defence employees to organise total strike for three days on 23-25 January 2019 to protest against and resist the most dangerous and disastrous move of the government of India to gradually dismantle the defence production network consisting of 42 Ordnance factories, DRDO, numerous Military Engineering Service (MES) Centres, Army Station Workshops etc through outsourcing more than 275 products so long being produced by the Ordnance factories in favour of private corporates, both foreign and domestic. This move of the government of India has already rendered half of the Ordnance Factories redundant, paving way for their closures or sell-out. Many defence procurement deals are also being hurriedly concluded or going to be concluded with foreign companies for supply of aircrafts, naval frigates etc giving rise to big scams and huge loss to the national exchequer. The strike is to defend the national interests and national security in particular. This struggle must have the support and solidarity from the entire people. Solidarity and Support to the Struggle of the Defence Workers.